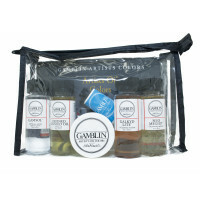 Gamblin Solvent-Free Gel is the only solvent-free painting medium that supports a broad range of painting techniques with minimal compromise. Solvent-Free Gel gives colours more flow and transparency, yet holds the shape of your brushmark. Solvent-Free Gel has a moderately fast drying rate and increases gloss. Made from safflower oil and alkyd resin, Gamblin Solvent-Free Gel is non-toxic and contains no Gamsol or petroleum distillates. 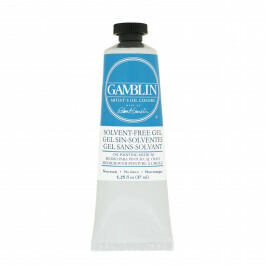 In comparison to other solvent-free mediums, Gamblin Solvent-Free Gel supports the broadest range of painting techniques with the least compromise across colour, dry time, texture and mark-making. To ensure proper drying of paint layers, Solvent-Free Gel should be used in moderation with oil colours. No more than 25% by volume. To avoid wrinkling, apply mixtures of Solvent-Free Gel and oil colours thinly. 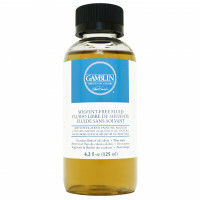 To paint solvent-free, we recommend Gamblin Safflower Oil for cleaning brushes while you are working. After your painting session, brushes can be further cleaned using Gamsol and/or soap and water.